Jeff DeWitt said a bidding process would have taken 24 months and cost DC money and strategic positioning. The Washington D.C. City Council amended its sports betting legalization bill to add a no-bid contract for Intralot to handle its sportsbook services. Intralot is the current lottery provider to the District of Columbia, too. The proposal to add the no-bid Intralot contract pased by a 7-6 margin. The proposal goes to a second and final reading at the full council meeting in early March, but the February 5th vote all-but-assures that the Intralot contract ill pass on the second reading. Only in the event of unforeseen developments or major opposition from the residents of Washington D.C. would the proposal fail on a second reading at next month’s full DC City Council meeting. The contract also extends Intralot’s lottery ticket service, as well. By next month, Intralot should have control of the District of Columbia’s lottery and sports betting services without the need of a bid from competitors. Proponents of the deal say the quick decision positions DC to build a sports betting industry before nearby states do the same. Their opponents question the no-bid contract at all. DC City Council officials faced charges of impropriety when they decided to take the unusual step of a no-bid contract. Officials fought back against such charges in a series of council meetings and a required public hearing last week on the proposal. While a soul-source contract is not the usual method, the council members said it was necessary to offer sports betting in a “timely manner” and to capitalize on legal sports kiosks’ financial potential. Jack Evans, who first introduced a sports betting bill for DC, was one of several council members who stressed the need for a quick decision on sports betting to avoid a 24-month bidding process. 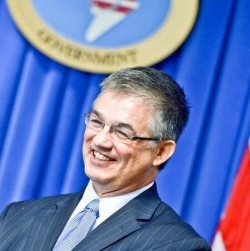 Washington DC CFO Jeff DeWitt, who oversees the city’s lottery, said that the no-bid contract was required in order to keep a process from playing out that might take two years. If DC’s leaders choose to forego two years of revenues to assure a bidding process, many residents would hold them accountable for the lost revenues. In the circumstances, DeWitt implied that Intralot made the most sense. Since DC leaders were satisfied with the services Intralot was providing on lottery ticket sales, it only made sense to expand its contract with the Greek lottery services and sports betting management company. The city’s chief financial officer made news when he said that the contract with Intralot needs to be expanded into an “all-encompassing contract”. Because the lottery company had no deal to handle sports betting, the contract must be redone for it to handle legal sports betting operations. Washington DC plans to allow sports betting kiosks at sporting arenas and stadiums, as well as other big event venues in the city. Despite the explanations, several city council members and a group of citizens who attended hearings before the Finance and Revenue committees expressed skepticism about the plan. Several raised concerns that foregoing a bidding process meant the city could not be certain it would receive the best deal. The skeptics called for an analysis of a bidding process by Spectrum Gaming, a consultancy group which prepares reports on the gambling industry. Proponents of the Intralot deal said the Spectrum Gaming analysis would add time to any bidding process. Jeff DeWitt said he would negotiate a strong deal with Intralot. That would include calling for a bidding process if the new deal did not meet “certain criteria” — though DeWitt did not say what that criteria would be. Backers of the Intralot contract pointed to efforts on both sides of the Potomoc that could create burgeoning sports betting markets, if a bidding process happened. The state legislatures of Virginia and Maryland each are considering legalizing sports betting. If legal sportsbooks opened in Northern Virginia or at MGM National Harbor before Washington DC kiosks opened, sports bettors might develop preferences for those out-of-District betting opportunities. While that might make bettors appear fickle, the real danger is sports bettors going to MGM National Harbor’s hypothetical sportsbook and being added to MGM Resorts’ customer database. Then DC bettors would be given a steady stream of comps, offers, and deals to drive 10 minutes to the Maryland casino. Gaming experts noted that neither Virginia nor Maryland are certain to legalize sports betting. Lawmakers in Maryland, perhaps the greater threat of the two, are not even certain whether they could legalize sports betting before a 2020 statewide referendum happens. The numbers the proponents of the Intralot deal raised eyebrows. The lottery company’s projected numbers suggested profits of 20% or more from the sports betting product, when the industry numbers on bookmaker’s turnover is closer to 5% at best. That raises the concerns that Introlot’s optimistic projections could be reached only if DC sports betting kiosks offered multi-team parlays or non-competitive odds. If single-game sports bets with competive odds were not offered (the 5% standard), then most DC-area sports bettors would avoid the kiosks and likely go to sportsbooks in Virginia and Maryland anyway.